The tragic death of actor Philip Seymour Hoffman has given us an opportunity to consider his estate planning, with lessons and strategies for the rest of us. Court documents in probate proceedings for Hoffman reportedly indicate that he declined his accountant’s advice to set aside funds for his three children because he didn’t want them to be “trust fund kids.” Instead, he left his entire $35 million estate to his longtime partner and the children’s mother, Mimi O’Donnell. The documents also indicate that he wanted his son and oldest child Cooper (age 10) to be raised in Manhattan, Chicago, or San Francisco. Assuming these reports are true, I have three observations. First, a deceased parent has little control over how (and where) children are raised by the surviving parent or another guardian. Even a will or trust provision naming a guardian of the person for a minor can be set aside in the child’s best interests. But it’s still a good idea to express such wishes, whether in a testamentary document or in a separate letter of instructions, just to be clear about what you want in case that makes a difference to those making the decision. 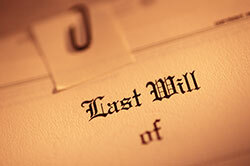 Second, a testator making an outright bequest has little control over how that bequest is used. In this case, there’s nothing to prevent the children’s mother from using a portion of the estate to create a trust or separate trusts for the benefit of the children. This might be a good idea, both to freeze the value of the trust assets for estate tax purposes and to protect the children’s financial interests from the mother’s potential creditors and predators. Third, Hoffman’s choice not to marry the children’s mother because “he just didn’t believe in marriage” means that the marital deduction is unavailable. As a result, the estate apparently owes about $10 million in federal estate tax and $5 million in state estate tax, after application of the IRC §2010 unified credit and the IRC §2058 state death tax deduction, assuming he was a resident of New York, as it appears. In California, the person making the disclaimer would be deemed to have failed to survive the testator and the disclaimed property would pass to the disclaimant’s issue under the “antilapse” statute unless the will expresses a contrary intention. See Prob C §20110. The disclaimed property would pass directly to the children without using any of the mother’s estate and gift tax exclusion, although it might be possible to impose trusts on the property by court order using guardians ad litem. Disclaiming $5 million could save $2 million or more in eventual estate taxes. Not what Hoffman may have wanted, but not his decision to make. Nothing can salvage the decedent’s unused generation-skipping transfer (GST) tax exemption because either the children or the children’s mother will become the GST tax transferors of the property, unless the children also disclaim (which they can do until age 21) and the property somehow passes to younger generation beneficiaries. But probably the decedent’s GST exemption won’t be needed, because the children and their mother have $20 million of exclusion among them. For more on lapsing gifts and qualified disclaimers, turn to CEB’s California Will Drafting §§12.17-12.19 and Drafting California Revocable Trusts §§8.18-8.20. On GST tax planning, see Will Drafting, chapter 15. Also check out CEB’s California Estate Planning, chapter 26 on asset protection and chapter 27 on predeath disclaimer planning. Perhaps he didn’t care about the taxes as much as lawyers do, and just wanted to leave everything he had to his companion, confident she would do what’s right.